Browse: Home / 2012 / April / Star Alliance award search and free alerts! Star Alliance award search and free alerts! It was a couple weeks ago, sitting at a restaurant with The Points Guy in Singapore and chatting about my travel tools that I said I wasn’t going to bother developing an award search tool for Star Alliance flights because there were already many others on the market and it wasn’t worth it. So it is something of a surprise even to myself that I’m announcing today the availability of Star Alliance award searches via the Wandering Aramean Travel Tools suite. With the “Saver Only” box checked it will only show itineraries that have availability in the discounted award levels. Those are also generally the same awards available to partner programs, though it may vary on United Airlines metal based on whether the MP number used in the query has status associated with it. But what if the route doesn’t have awards available and you don’t want to keep checking back all the time to see if the award space opens up? Well, there’s a tool for that, too. Just click on the My Alerts link and you can configure the system to check for you and email you when it finds seats available. By default all members can have up to 10 active alerts which will be queried daily. First Class members can have up to 50 active award alerts and they will be queried at least 4x daily. So come on over and find your Star Alliance award seats today. I’ve got a number of additional features I hope to add, including saved searches and search history online to make things even easier over time. Nice good job, this is the tool I was looking for. This is minor (to me) but IAD -> HKT on 11/17 doesn’t pull up results but IAD -> BKK does, but the UA site shows IAD -> HKT options. Re alerts, one key feature for me would be the ability to filter out mixed class type fare’s – as in give me FA+ only, and maybe limit the flight results based on the total hours of the trip. If it had that I’d be setting alerts like crazy. I see the same bug you are seeing with the IAD-HKT query. It is actually returning the results correctly from the server so I need to see why it isn’t populating the database correctly. I’ll get on that right away this morning. As for the alerts, excluding mixed-cabin itineraries is definitely possible and I should be able to add that as an option. I’m also looking to add a non-stop only filter at some point. The Weekly Flyer – its your United MileagePlus Number. I got the IAD-HKT award search fixed. Turns out the issue was that there were too many successful search results. The system couldn’t handle a successful results string that long. How do you use my MP Number? Do you just use it for the single search and not save it? Or do you save it / store it? Just trying to understand this for privacy concerns… Thank you. For the alert searches the MP number is stored for obvious reasons; I cannot run a search from the system without it. For the regular searches it is stored for now as well. The main reason for this is that I’m building in to the system saved searches and recent searches to ease recurring search functionality. I can certainly understand not wanting to share the information if it makes you uncomfortable, but, much like my commitment to not selling email address lists or anything like that, I will not be using the FF#s for anything other than user-initiated searches. I suppose that I can probably migrate that data out to a cookie or something like that rather than storing it server-side, but it is always going to be passing through the system anyways so not much real motivation IMO to change it when I’d have access to the data anyways. Checking the saver only box, but still getting standard awards returned. Do I need to do anything else? Hey Wandering Aramean, Cool tool, but other than the alert feature, is there another feature that would set this apart from the improved United reward search tool? I can see that this is much easier than the ANA tool, but just curious what makes this better in your eyes. Please enter a valid MP FFN. I am having trouble getting my alerts to setup. After I fill out the form and click to submit it takes me back to the home page and I go to look at “my alerts” and nothing is saved there. Any idea what is happening? @Corey – I just made a couple minor updates to data validation for alerts. Check that and see if it helps you out. @Rohit – The great thing about this is that you can use it for US Air redemptions, too, as they are both Star Alliance partners. At least for now. You do need a UA FF# to use it, but just sign up for one for free and don’t worry about it. I am considering expanding to SkyTeam and oneworld but no commitment there yet. @theblakefish – It sure is similar to the UA site, no doubt. I think that the alerts are compelling. I think that forcing saver-only is an upgrade from the basic search you’re getting directly. I think that the ease of multi-day search for First Class members is a huge benefit. There are still reasons the ANA site is better, especially for searching multiple different routes at the same time, but this is very easy and very clean, I think, and hopefully useful to folks. Any plans of expanding this to members of other *A FFPs? My primary USA-based program is US Airways at the moment.. Password change is working now; I had a bum link in the nav bar there. Sorry about that. Also, I’ve added Search History. This lets you see what the results were for you past 25 searches. Dunno if it is actually useful or not but I have the data so I put it out there. There is a link in the nav bar above, Robert, but I added another one to the bullet list just to help increase exposure. @Seth: How are you able to perform searches on United using a MP, don’t you need the account password as well? My testing so far suggests that it is honoring the status-based availaility but I don’t have a huge sample size to work with yet. HI Seth, it seems that the alert for other carrier does not work. For example, I was checking for J availability for CA965 on Aug 2. I tried an alert for 4/30, which has available seat, but I never received an email notice. My email is spelled as you see and was enterred correctly. There is no delete function right now. The comparable function is to set an alert as inactive. You can do that in the edit dialogue. There are a few reasons I built it that way but I’m not really sure they matter. It looks like the alert function works now. Got an alert every 4 hours. Nice! it is not taking my LH FF# in the MP# field. What am I doing wrong do you think? You need a UA MP number, not an LH M&M number. Accounts are free to sign up for. 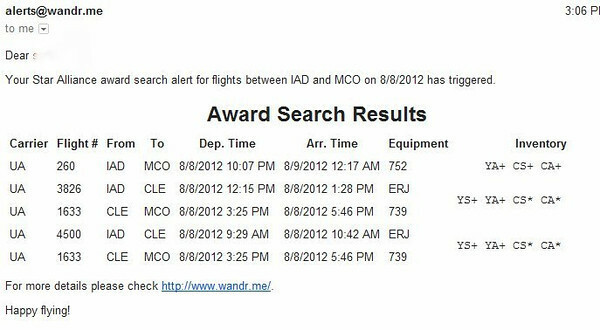 ok, I used my UA number for the search; but ultimately I will be using my LH miles for the award flight. I see a direct flight on UA from FRA to SEA (among many other UA options). Although I would prefer not to fly UA, I should be able to call LH and ask for this particular award flight correct? Thank you! That is correct, Damon. There is a chance the UA metal awards might not be available to partners or that LH group metal might be available that you aren’t seeing with this search, but overall it should be very close. strange – I tried the fare search from Ord to Asia, and got no fares found. The upgrades are still processed manually, Harry. I was out at lunch so didn’t get this one handled until just now. Enjoy! Thanks for the quick response Seth. I hope it was a good lunch. Hi Seth, first of all, spectacular work on this tool! Its a total lifesaver and time saver, thanks!! Quick question. I created a few searches, specifically FRA-DFW in FC for 10/19/12, I actually did not get an alert even though inventory shows up on KVS, also created searches for FRA-DFW for J inventory for 11/28/12 and same thing again, inventory shows on KVS, but the tool didn’t alert me. Is there a glitch? Also noticed that when searching, i can add my MP#, but when creating alerts, this field isn’t available. Could this be why its causing this problem? Thanks in advance! Again, awesome tool, thanks so much for creating it. I am waitlisted for a Kris Flyer Business Saver ticket, Perth-Bangkok via Singapore and cant see the SQ216 flight on the list we I fill in the details? P.S Great tool you have created. How do I select saver awards only for Star Alliance searches? I see it in your screenshots above, but not on the site. Is that feature no longer available? Not to worry, Colin. The option is no longer there because I decided that all searches should always be saver only. In other words that option is forced from the back-end now so you don’t have to select it any more. regarding saver awards, what if I’m willing to consider a regular award? Is there a way to see them too? Also, when i try to create an alert I get a screen requiring an airline and a flight number, is there a way to alert for any star alliance carrier on any flight for my destination? Lately it has been pulling in both saver and regular awards – or maybe it’s not pulling the proper rewards based on my Platinum status as the email has had more than just “business saver awards” as my search is setup for. The tool is only showing saver award inventory. If you think it is showing more than that please forward me the alert email you’re getting and I can check it more closely. It will show all results on a given day if any flights on that day meet your parameters, so you may see more results than you were expecting, but the specific request should be one of the positive results on the list. If you don’t care about the carrier or flight number just leave those fields empty. after i create my alert where will it email me if a flight is available? Emails are sent to the address you used when you registered.